TUBELESS, SPOKED AND READY TO ROLL. Featuring Tubeless spoked wheel in light alloy plus all the great features of the 950S. The Multistrada 950 offers extraordinary versatility making it the ideal motorcycle for all types of use, any time of day. The essence of versatility Multistrada 950 with spoke rims, in the two Ducati Red and Star White Silk colors. The new Ducati Multistrada 950 takes things to the next level thanks to a series of improvements designed to make it safer and even more enjoyable. Moreover, for the very first time, a super-technological S version featuring state-of-the-art electronics is available. 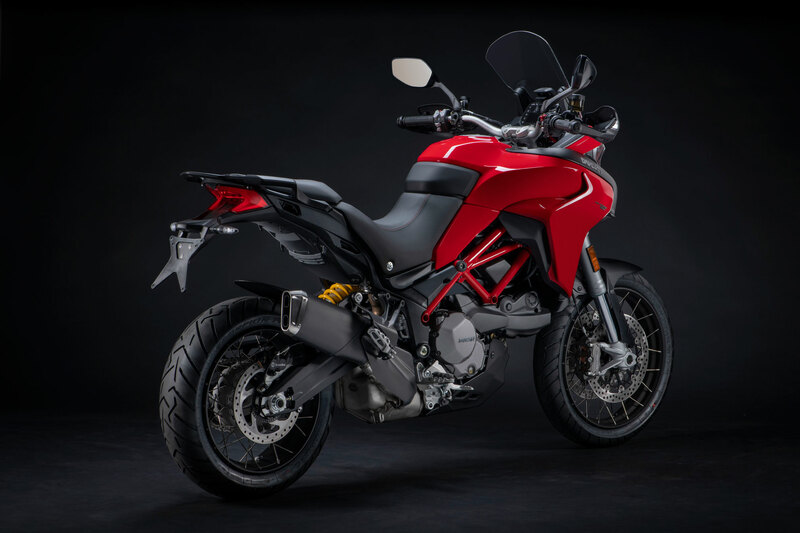 The new Multistrada 950 now comes with a 6-axis Bosch IMU (Inertial Measurement Unit), Bosch Cornering ABS, Vehicle Hold Control (VHC) for easier uphill starts (especially when the bike is carrying passenger and luggage) and a hydraulic clutch. What’s more, the swingarm and wheels – both the newly designed alloy wheels and spoked versions – are lighter. An upgraded rider-bike interface (HMI) is now more user-friendly than ever. Indicators feature an auto-off function that takes into account both lean angle and distance travelled. Then there’s the new Multistrada 950 S, which offers cutting-edge technology to enhance both safety and sheer riding pleasure. Electronic suspension with the Ducati Skyhook Suspension (DSS) system continuously adjusts fork and shock absorber damping so the suspension responds instantaneously to changes in road surface. Ducati Quick Shift up & down (DQS) allows clutchless upshifting and downshifting and the bike also features a full-LED headlight, 5″ colour TFT display, a Hands Free system, Cruise Control and backlit switchgear controls. 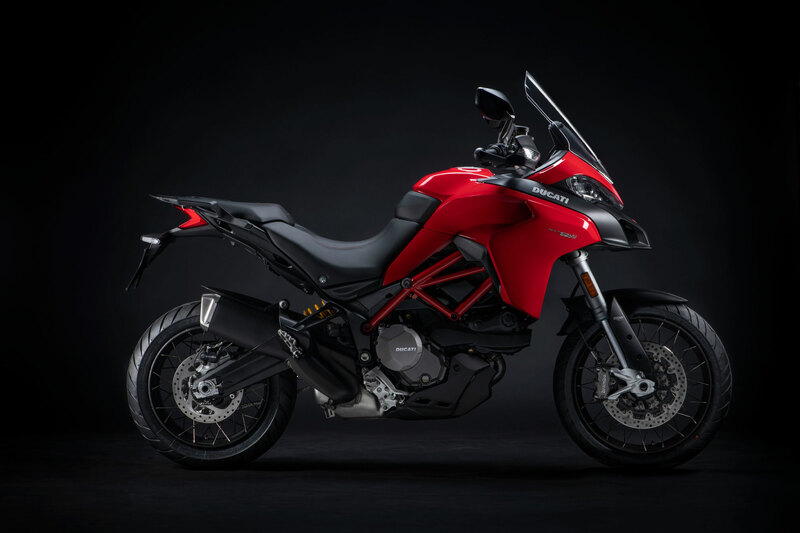 The Bologna-based bike manufacturer’s smallest “multibike” was designed to provide all the excitement of the Multistrada in a more accessible, versatile package that makes every ride an extraordinary journey. Now, thanks to the latest features, this bike fully satisfies the needs of an even greater number of motorcyclists. 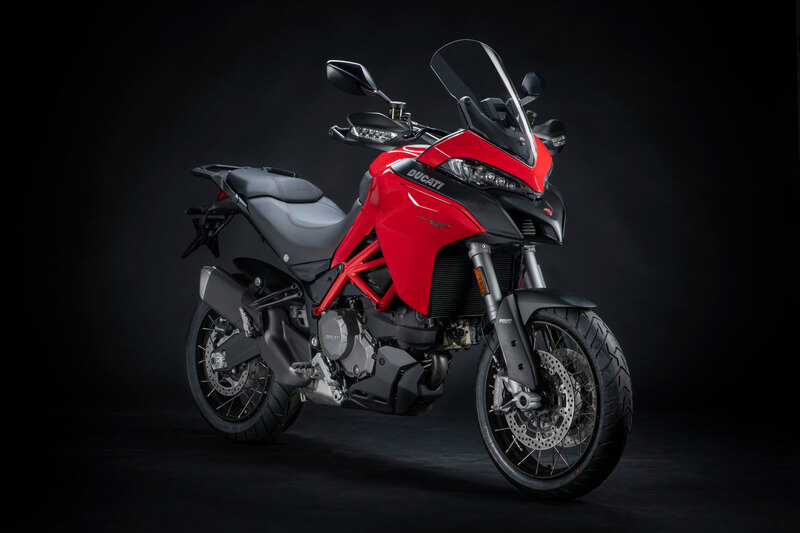 Designed to put performance within everyone’s grasp, the new Multistrada 950 is for those who want to get in some touring (perhaps with a passenger and some luggage) and those who want an agile fun bike that’s ideal for everyday use. From a styling viewpoint, the new Multistrada 950 inherits the side ‘wings’ from its bigger 1260 counterpart, making the front even cleaner and more streamlined. Its 937 cm3 twin cylinder Testastretta 11° engine – which puts out 13 hp (83 kW) at 9,000 rpm and 9.8 kgm (96 Nm) at 7,750 rpm – is equipped with a self-servo wet slipper clutch that now requires less on-lever effort thanks to the new hydraulic control system. Maintenance intervals – set at 15,000 km or 12 months, with valve play inspection every 30,000 km – set an industry-leading benchmark. The tubular steel Trellis frame is linked to a new, lighter double-sided aluminium swingarm, giving the new Multistrada 950 excellent dynamic performance. The 19″ front wheel ensures comfort and fun on any road surface, asphalted or not, in the city or on country tracks. Suspension with a generous 170 mm of travel keep comfort levels high while ensuring outstanding agility. Moreover, the 20-litre tank puts plenty of miles between refuelling stops. The electronics package now includes Bosch Cornering ABS, Ducati Traction Control (DTC), Vehicle Hold Control (VHC) and, on the Multistrada 950 S, semi-active Ducati Skyhook Suspension (DSS), Ducati Quick Shift up/down (DQS) (available as an accessory for the Multistrada 950), Ducati Cornering Lights (DCL) and Cruise Control. Both the Multistrada 950 and the Multistrada 950 S can mount the Ducati Multimedia System (DMS). Clean surfaces, taut lines and contrasting front and rear volumes remain the Multistrada hallmarks, but this time they reach new heights of quality and style. 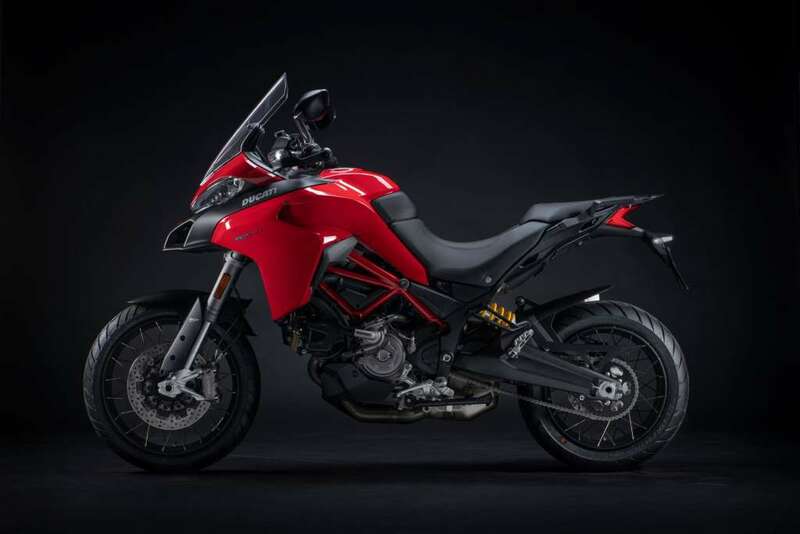 The latest Multistrada 950, in fact, features new side wings, taken from the Multistrada 1260, which make the front end even cleaner and more streamlined. The Multistrada 950 combines Multistrada 1260 and Multistrada 1260 Enduro design features to perfection, taking the ‘lightest’ elements from both. The front end – with the distinctive horizontally extended headlight, the ‘beak’, adjustable screen, side ‘wings’ and tank – takes its cue from the Multistrada 1260. The rider’s seat, passenger seat, rear grab rail, the design of the exhaust and swingarm and the wheel sizes are, instead, taken from the Multistrada 1260 Enduro. This mix has produced a bike with classic Multistrada lines that’s also compact, and not just visually. 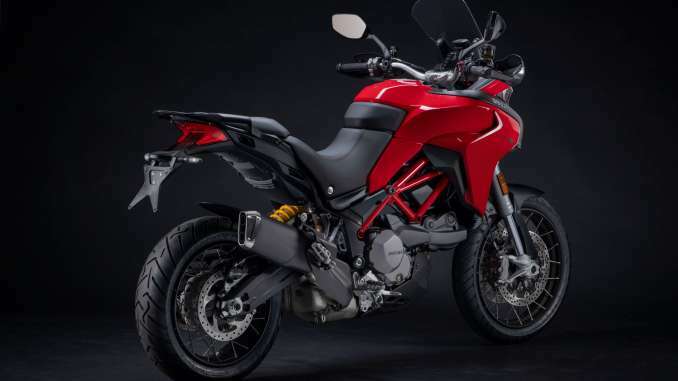 Key design features on the Multistrada 950 include the new, lighter aluminium alloy wheels and the now-lighter spoked wheels available for the S version. Built with long-range touring in mind, the Multistrada 950 has been designed to ensure outstanding comfort even when fully laden. This has resulted in an ergonomic “triangle” that guarantees, for rider and passenger alike, comfort and control whatever the situation. The bike is ‘roomy’. It can easily seat two people, even with top case and side panniers mounted. Foot pegs have been lined with rubber inserts to dampen vibration. Another as-standard feature on the Multistrada 950 is the 840 mm high seat, which instils an immediate sense of comfort and wanderlust. A lower seat (820 mm high) is available so riders can place their feet on the ground more easily, as is a higher (860 mm), even more comfortable one. The Multistrada 950 screen allows for one-handed vertical adjustment within a range of 60 mm; the accessory line also includes a lower screen. There are two 12 V power sockets, one in the zone immediately beneath the passenger seat, the other in the dashboard zone. These can be used to power items such as thermal clothing, intercoms or mobile phone chargers. The Garmin sat-nav, available as a Ducati Performance accessory, is powered via a dedicated connector. There’s also a USB port underneath the seat, which can be used to charge smartphones. spacious panniers and a top case. The passenger grab rail has specifically been designed to minimise bike width. Touring accessories also include heated grips, a must in bad weather. The Multistrada 950 is powered by the already renowned twin cylinder 937 cm3 Testastretta 11° with Desmodromic timing. Euro 4-rated (in countries where Euro 4 standards apply), this liquid-cooled engine has four valves per cylinder and bore and stroke measurements of 94 and 67.5 mm respectively. Engine power amounts to a maximum of 113 hp at 9,000 rpm and a maximum torque of 96 Nm at 7,750 rpm. The compression ratio is 12.6:1. The Multistrada 950 gulps in the fuel mix through 53 mm cylindrical-section throttle bodies controlled by an advanced Ride-by-Wire system. The exhaust system is of the 2-1-2 type with lateral silencer. The self-servo wet slipper clutch can now be operated with less on-lever effort thanks to the new hydraulic control system. The Multistrada 950 engine has maintenance intervals of 15,000 km or every 12 months, with valve clearance inspection every 30,000 km. The Multistrada 950 frame features a solid Trellis section with large-diameter, low-thickness tubing and two lateral sub-frames, closed off by a rear load-bearing techno-polymer fibreglass element to maximise torsional rigidity. The Multistrada 950 has a minimum ground clearance of 183.5 mm. A 1,594 mm wheelbase distributes rider and luggage (where applicable) weight perfectly, enhancing the vehicle’s dynamic performance. The new, lighter, shell-cast aluminium twin-sided swingarm is painted black. The Multistrada 950 has a front upside down 48 mm fork with 170 mm of travel, a dedicated cast fork leg, plus fully adjustable spring pre-load and hydraulic compression and rebound damping. At the rear, a shock connects the swingarm to the left cast sub-frame: again, spring pre-load is adjustable (via a the knob-operated hydraulic press), as is hydraulic compression and rebound damping. The spring is progressive, consequently increasing ride comfort even with the bike fully loaded. Rear wheel travel is 170 mm. The DSS Evolution system allows fast, user-friendly bike set-up via the new Multistrada 1260 Enduro HMI interface, ensuring suspension is exactly as desired whatever the ride conditions. Just select the desired riding mode (Touring, Sport, Urban or Enduro) and the load configuration: rider only, rider with luggage, rider with passenger or rider with passenger and luggage. Moreover, it’s possible – without any need to tackle complicated sittings – to act on fork and shock absorber separately to fine-adjust front and rear suspension. The system has practically unlimited configuration potential, as the rider can electronically select 400 parameter combinations via the new interface. Riders can also mechanically adjust front fork pre-load. The Multistrada 950 features redesigned wheels that reduce overall weight by 500 g compared to the previous model. Wheels measure 3.0” x 19’’ at the front and 4.5” x 17’’ at the rear and mount Pirelli Scorpio Trail II tyres (120/70 ZR19 at the front and 170/60 ZR17 at the rear). This tyre offers a perfect blend of off-road racing capacity and great road performance. Designed for the most demanding motorcyclists, its plus-points include high mileage, consistent performance throughout its life-cycle and first-class performance in the wet. Compared to its predecessor, this new tyre guarantees higher mileage without compromising cornering performance and, above all, ensures excellent wet weather performance. The SCORPION™ Trail II profiles derive directly from those used on the ANGEL™ GT. Thanks to a shorter, wider contact patch, the profile helps reduce and even out tread wear, thus extending mileage. New profiles have also improved handling, which remains consistent throughout the product life-cycle. The Multistrada 950 S is also available with tubeless tyre wheels with aluminium rims that have 40 cross-mounted spokes and gravity-cast hubs; these mount chunky Pirelli SCORPION™ Rally tyres, better suited to off-road riding. The entire Multistrada family features a Brembo braking system with the ABS 9.1ME Cornering device, an integral part of the Ducati Safety Pack (DSP). Bosch Cornering ABS makes use of the Bosch IMU (Inertial Measurement Unit) platform to optimise front and rear braking power even in critical situations and with the bike at considerable lean angles. Through interaction with the Riding Modes, the system provides solutions suitable for any situation or riding condition. The Multistrada 950 features Brembo M4-32 monobloc radial calipers with four 32 mm diameter pistons and 2 pads, a radial pump with adjustable levers and dual 320 mm front discs. At the rear a 265 mm disc is gripped by a floating caliper, again by Brembo. Such top-drawer components ensure unbeatable performance, a feature that has always been a Ducati hallmark. On the Multistrada 950, Ducati Traction Control (DTC) detects and subsequently controls any rear wheelspin, enhancing both bike performance and active safety. The system lets riders select from among 8 different profiles, each calibrated to provide a rear wheelspin tolerance that matches progressive levels of riding ability (classified from 1 to 8). The Multistrada 950 mounts an ABS that features the Vehicle Hold Control (VHC) system. When activated, the latter holds the vehicle steady by applying rear wheel braking (if unused, automatic deactivation occurs after 9 seconds). The function is activated when, with the bike at standstill and the kickstand up, the rider applies high pressure on the front or rear brake levers. The Multistrada 950 S can be started without an actual mechanical key thanks to the new Hands Free system that raises security standards. Just walk up to the vehicle with the electronic key in your pocket: once within 2 metres of the bike the key code will be recognised and ignition enabled. At this point just press the key-on button to power up the control panel and then start the engine. Ducati Riding Modes, first introduced on the Multistrada in 2010, allow selection of different pre-set modes that optimise bike behaviour according to individual riding styles and road conditions. The Multistrada 950 has four Riding Modes (Sport, Touring, Urban and Enduro), each programmed to act on the electronic Ride-by-Wire (RbW) engine control system and the ABS and DTC levels. The available modes stem from a combination of cutting-edge technologies. Riding Modes can be changed on the go, while personalised ABS and DTC settings need to be made with the bike at standstill and the throttle closed. Touring Riding Mode delivers a maximum power of 113 hp with progressive Ride-by-Wire throttle twist response, DTC is set higher as is ABS, maximising both braking stability and wheel lift-up prevention. Selecting Sport Riding Mode transforms the Multistrada 950 into an adrenalin-fuelled bike with a maximum power of 113 hp. This Riding Mode is characterised by a direct Ride-by-Wire throttle twist response, a low DTC setting and low ABS setting with no rear wheel lift-up prevention. Urban Riding Mode delivers a maximum power of 75 hp with progressive Ride-by-Wire throttle twist response; DTC is set to an even higher intervention level as is the ABS, maximising braking stability and wheel lift-up prevention. Enduro Riding Mode gives the Multistrada 950 a maximum power of 75 hp with progressive Ride-by-Wire throttle twist response; DTC intervention is suitable for off-road use and the ABS setting is low, deactivating rear wheel lift-up prevention. The Multistrada 950 instrument panel with revised, upgraded interface, consists of a large easy-to-see LCD showing primary and secondary information. The S version, instead, has a high resolution TFT display, the same as the one on the Multistrada 1260 S and Enduro. Easy to read even in direct sunlight, this display features an extremely user-friendly interface that makes menu browsing and setting adjustments easier. To manage the new HMI, the Multistrada 950 S has the same backlit switchgear controls as the Multistrada 1260. Like other bikes in the Multistrada family, the 950 has an assertive-looking, high-tech headlight. At the rear there is a LED tail light. On the S version, the headlight assembly is a full-LED model featuring Ducati Cornering Lights (DCL) which optimise lighting on bends according to the bike lean angle. The Multistrada 950 has an all-new function that switches off indicators automatically according to lean angle. Thanks to the IMU (Inertial Measurement Unit) the indicators shut off after completing a turn or travelling a prolonged distance.